Catch a Crab Tours offer the chance to experience the nature of the scenic Tweed River and try the succulent taste of fresh mud crab, straight from the river. 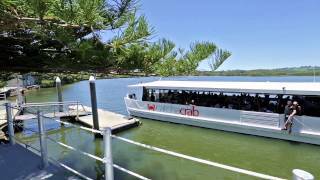 For visitors to the Gold Coast and the Tweed, Catch a Crab Tours is a must-do river cruise activity and offers both tour-only and meal packages. On each Catch a Crab Tour, you'll get the chance to haul in live crabs, which are cooked fresh on board the boat. You can also hand feed friendly wild pelicans, pump for yabbies, and try your hand at fishing. Visit some of the Terranora Lakes's working oyster farms, where the Sydney Rock oyster is grown and shucked fresh daily. Learn how an oyster grows and travels from the farm to your plate! At the Lakeside Café, their chef prepares fresh crab and seafood dishes to order using only the best ingredients and the freshest, tastiest mud crabs. For a tasty tour on the river, full of great experiences, adventures, and flavours ensure that you include a Catch a Crab Tour in your holiday plans!